Kiwi nurse Rolands Selis has recently returned from a six month mission with New Zealand Red Cross in Lashkargar, Afghanistan. In recent months there has been a surge in fighting between the Taliban and Afghan national forces around this region, resulting in the displacement of more than 3,000 families – many of whom had initially travelled to the city of Lashkagar in search of refuge. His primary role was to support first aid training for combatants on both sides of the conflict, and ensure the smooth operation of a taxi service that transported wounded people to the nearby Emergency Hospital. A typical day saw him working with stakeholders, distributing first aid supplies, preparing reports, and connecting with patients. Rolands estimates that the team would have run around 25 first aid courses during his mission. At the compound where he slept and worked, Rolands lived comfortably in a large bedroom which, interestingly, had its own fortification in the form of sand bags outside. Although the sand bags cast a slight shadow over much of Rolands’ living space, he found solace in a reading nook that overlooked a tree outside. 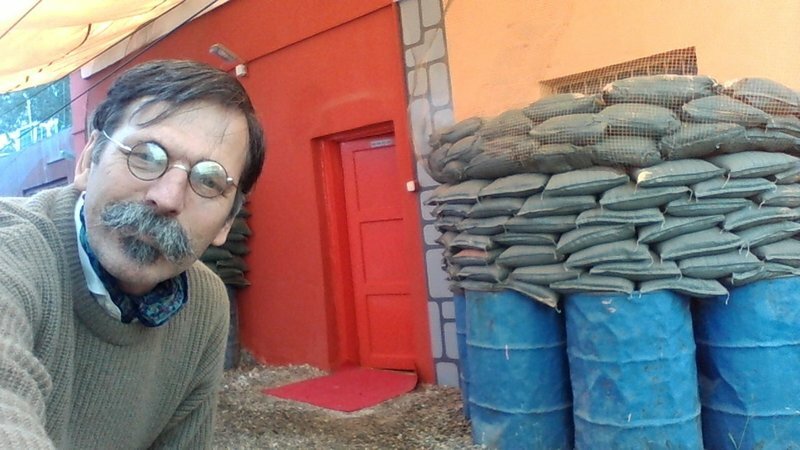 Rolands outside his well-protected bedroom in the Lashkargar compound. NZ Red Cross. Rolands operated the emergency radio every evening and appreciated any opportunity for down time, during which he could often be found baking or even sewing a pair of moleskin trousers. While it was not possible to leave the hospital/residential compound (other than on scheduled field trips), local vendors were able to supply most ingredients and Rolands’ baked goods were in hot demand. On his first and final days in the field, Rolands tended to the wounds of two young patients who had been victims of tragic land mine injuries. These instances, in his eyes, epitomised the damaging consequences of war. Rolands is looking forward to his next mission, which he is hoping will be in South Sudan.